Thomas E. Currie et al. There is disagreement about the routes taken by populations speaking Bantu languages as they expanded to cover much of sub-Saharan Africa. Here, we build phylogenetic trees of Bantu languages and map them onto geographical space in order to assess the likely pathway of expansion and test between dispersal scenarios. The results clearly support a scenario in which groups first moved south through the rainforest from a homeland somewhere near the Nigeria–Cameroon border. Emerging on the south side of the rainforest, one branch moved south and west. Another branch moved towards the Great Lakes, eventually giving rise to the monophyletic clade of East Bantu languages that inhabit East and Southeastern Africa. These phylogenies also reveal information about more general processes involved in the diversification of human populations into distinct ethnolinguistic groups. Our study reveals that Bantu languages show a latitudinal gradient in covering greater areas with increasing distance from the equator. Analyses suggest that this pattern reflects a true ecological relationship rather than merely being an artefact of shared history. 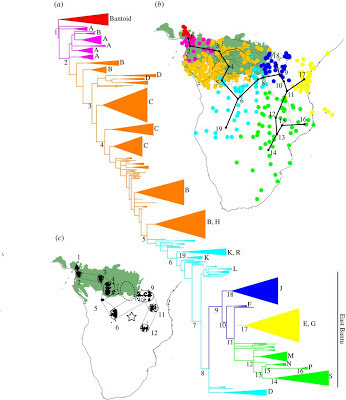 The study shows how a phylogeographic approach can address questions relating to the specific histories of certain groups, as well as general cultural evolutionary processes. Brilliant. Hopefully it will be the template for further studies in language expansion. Presumably we will now be able to trace the Y-DNAs involved also. This is, in a sense, proof that phylogenetic methods in historical linguistics can be done right. I'm not too sure about their conclusions on language geography, but at least the basic data is generally sound, and all the caveats are clearly stated. Others should learn. This pattern of migration chimes with some linguistic archeology. Apparently the eastern and southern languages didn't retain the ancestral terminology for cattle that the western languages did, having been unable to keep cattle in forested areas and they borrowed most of it later from Nilotic or other languages already in the area, who they got new cattle from. This map shows how that would have happened.